Eversley is located just to the north of one of the UK’s most popular seaside towns, Great Yarmouth, and is a short stroll from the promenade and beach. A multi-award winning home, Eversley offers exceptional residential and nursing care, specialised dementia and end of life care, with respite care also offered subject to availability. Explore the services provided at Eversley, which are designed to make every resident’s stay a pleasant one. What our families,friends & staff say? “To all staff at Eversley, We just want to say thank you all very much for your help and kindness you gave to my mom especially over last weeks. It was very much appreciated. Take care, love to you all, from all family..”. “Dear all,thought of Nursing Home as his second home and always spoke highly and fondly of all the staff, your care for him was second to none .....With greatest thanks Family....”. “As an ex-paramedic I have had the opportunity of visiting many care establishments, and I can honestly say that you should be very proud of the way Eversley is run and the excellent loved of care. I have witnessed whilst visiting my friend since last year.”. You will find information regarding a variety of services that we offer within Kingsley care homes. A collection of jargon-free useful information, advice and tips created to help you and your family understand the different types of care and care requirements, funding for care and other concerns relating to care for the elderly. Take a look at our award-winning unique approach to care and see how we make a difference to the people we care for. Don’t worry if you cannot find what you are looking for; you can contact the home by telephone or email. We will be more than happy to help you with any question that you may have regarding care for the elderly. Eversley offers a self-contained, comfortable retreat set amongst beautifully maintained gardens where residents can breathe in the fresh seaside air. The two comfortable lounges have an abundance of chairs and large flat-screen televisions ensuring everyone can enjoy the latest programmes. We are a small, passionate team with four highly experienced nurses who love their job. Eversley offers high quality personal care and modern care technology to aid a dignified and more comfortable life. We have found many of our clients actually improve in health or extend their life expectancy during their stay in the home. In March 2013, Eversley Nursing Home achieved Quality Hallmark Award-Gold Standard Framework Care Home Accreditation for the high quality of care provided for people in the final years of life. The Gold Standards Framework (GSF) is a framework to enable a ‘gold standard of care’ for all people nearing the end of life. The GSF delivers quality improvement through training, leading to quality assurance with its full accreditation process plus quality recognition for the staff of care homes involved. Eversley works within the Gold Standards Framework (GSF) which has a person centred approach considering dignity of care, spirituality and other means to improve the quality of care. In February 2014 Eversley Nursing Home was also the winner of the Norfolk Care awards category: ‘Effective Coordination of End of Life Care’. We are also members of the National Care Association for 2015 – 2016. Being diagnosed with dementia can be a very difficult and confusing time for the individual and their loved ones, and it is only natural to feel anxious about what life in the future will be like. At Eversley we strongly believe that the transition into our care should be smooth and carefully assessed in order to minimise upset to all concerned. Whether it’s a friendly face, a warm smile or taking time to listen, making a positive difference to someone’s day is important to us. Residents who are experiencing memory loss benefit from our enlightened approach to dementia care, which stimulates, supports and comforts in a safe and homely environment. We are committed to providing the best possible outcomes for these residents, and we achieve this through our ‘Wings’ (Welcome, Individuality, Nurturing, Guidance, Sensitivity) philosophy of care. This award-winning approach is nationally recognized and our bespoke learning programme is designed to ensure that the person with a dementia is at the heart of everything we do. We place great importance on the lives our residents have led and spend time with them and their family members to find out about their tastes, history, hobbies and interests. Family and friends are significant partners to us and we welcome feedback and suggestions at all times. The information shared helps us to create individual care plans for each individual, which are paramount in providing the best care, and also helps us get to know them well. Residents are supported to achieve their aims by taking part in meetings, surveys and one-to-ones where possible. We have a spiritual and calm environment here at Eversley, and we have links with therapists, GPs, the church, chiropodists, and even have our own Caprice bath with three spa options. Hydro Spa option gives the therapeutic effect of bathing with relaxing underwater muscle massage. The bubbling bath has air heaters, which maintain constant temperatures and keep the patient warm. Diffusers located along the floor of the bath mean that the massage can be controlled for preference. Aroma Spa option uses the beneficial effects of essential oils for an aromatic bathing experience, creating the feeling of serenity and relaxation. Colour Spa option has large integrated lights, which illuminate and colour the water. Coloured lights have positive psychological and physiological effects and can help maintain and restore health. The spa range is designed to benefit those with disabilities, mental and behavioural disorders, as well as those who are visually, hearing and/or speech impaired. First and foremost, we welcome and encourage our residents to make their rooms here as homely and personal as possible, by furnishing them with their own belongings to create a space they feel safe and happy in. Paintings, a favourite ornament and plenty of family photographs can all be of comfort and really calm unsettled feelings. The staff here all have a kind and caring nature, they understand the meaning of real person-centre care and are skilled in engaging residents in meaningful activities where appropriate. The home is continually committed to specialist training, which enables staff to help individuals express their needs and maintain a high level of independence, self-worth and well-being. Residents can rise whenever they like at the home and have a choice between hot and cold breakfasts. They are welcome to have breakfast in bed, but many enjoy the friendly communal areas. Staff often sit and eat with the residents and don’t wear uniforms or badges, which adds to the relaxed, homely feel of mealtimes. Families and friends are welcomed at all times of the day and can eat with their loved ones either in their room or in other areas. The enthusiastic, caring staff are always on hand to be with residents throughout the day, and are compassionate about helping individuals to do what they enjoy. They are encouraged to be impulsive, to swap stories, to laugh and cry with the residents, whilst residents are encouraged to follow their own interests and make their own decisions. Hot drinks, tea, coffee and snacks are served throughout the day. For lunch and supper there is a choice of mains and desserts, and we invite the able residents to help set the tables, which many enjoy doing. Some residents also help out around the home with other chores. Mealtimes are a sociable time and staff are skilled at getting even the quietest residents to feel involved. After supper, some residents opt to go to bed early or retire to their rooms, while others stay up until later, relaxing in their choice of communal area. There are hot and cold drinks, alcohol available to those that want it, and NO set bed time, as this is residents’ home. Each Kingsley care home is unique, but we all have a set of highly respected and award-winning features embedded within the culture. Our daily emphasis is on the care that our residents need, whether that be physical, emotional, spiritual or mental health. We encourage all our residents to live as healthily as possible, to aid long and pleasant lives. We encourage appropriate exercise, keeping minds active and eating nutritious food and our healthy, balanced meals are made from scratch using only the best, locally sourced ingredients. We understand that people’s tastes and habits are different, and we ensure that the varied menu includes a great selection of nutritious delights and individuals’ favourites. Take a look at our truly person-centred approach to care. The highest standard of Dementia Care. Eversley Nursing Home has 18 beds and is registered for elderly and dementia care with the Care Quality Commission. Located in Great Yarmouth just north of the busy town centre, the home is only a short stroll from the promenade and beach. The nearest mainline railway station can be found approximately half a mile from the town centre and local buses give easy access to other areas in and around Great Yarmouth. The home has been carefully designed to create a homely living environment for its residents. The home is on three levels with a passenger lift to all floors. It has large, comfortable communal areas comprising two lounges, two dining areas and smaller quiet areas for the privacy of residents and their families. These host plenty of comfortable chairs and large flat screen televisions. Eversley has eight en suite single rooms, eight without, and one en suite double room. Also two bathrooms, one shower room, TVs and telephone points. Outside, the home offers a secure landscaped garden where residents and their guests can sit and enjoy the warm summer days. Installed in the building are hoists, accessible bathing facilities, lifts, call bells and door alarms. All pressure care equipment is provided, including pressure mats and specialised mattresses. Visit us virtually – take a 360° virtual tour and get a feeling of Eversley. 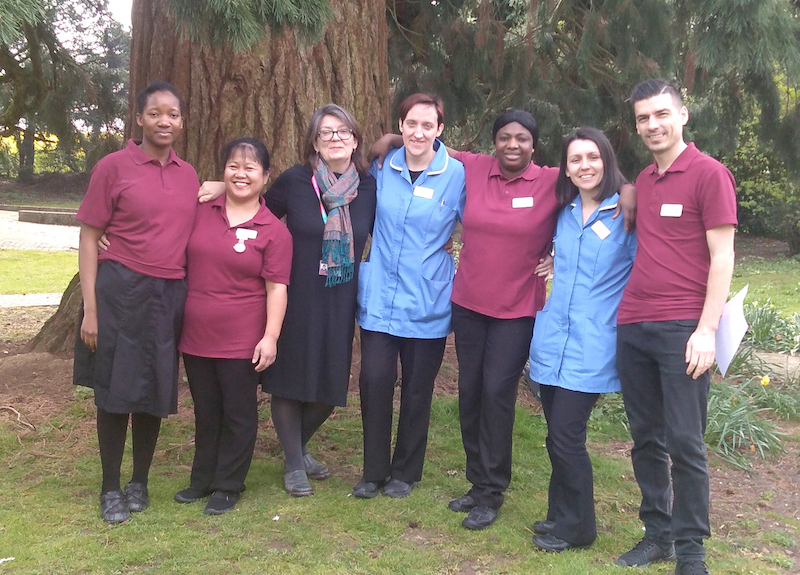 The care team at Eversley are specifically selected to meet the criteria of a person-centred worker, and undergo a continuous programme of training, on both practical and theoretical levels. Most of our training is facilitated by our own training arm, Kingsley Academy. The staff at Eversley are here because they love the work they do, many staff have been working in the home for years and still hold the same amount of passion to care as they did on their very first day. I am a qualified nurse with over 32 years’ experience in care of the elderly with both the NHS and in the private social care sector (Poland and UK). My passion is care of the elderly. I have been working in Eversley Nursing Home since 2005, starting work as a care assistant waiting for my qualification to be recognised by the NMC. I then started work as a nurse and was promoted for Clinical Lead Nurse position. I have developed close links with all outside professionals such as GPs, district nurses and Macmillan nurses. I am also the GSF (Gold Standard Framework) Coordinator at Eversley. I have 30 years’ experience working hard as a nursing after graduating from Medical College in Poland. I have worked in Care in England for 10 years and been with Kingsley for 8 years, I believe in the support and help the company provides to its employees. I am very proud to be a part of achieving the Gold standard Framework Award for the home. I joined Kingsley Healthcare as a part-time trainee office administrator at 2013, while I was completing my higher studies at University of Bolton. After completing my (BSc Hons) Computer Science Degree, I joined Eversley Nursing Home as an administrator from April 2015. I’m pleased to be working at Eversley as it has a homely feel. I have worked in care for 25 years. I have been at Eversley for 19 years which I have thoroughly enjoyed. I was a support worker for 7 years I am now recently employed as the cook which can be very interesting with the challenges of people different diets textures of food and preferences. My achievements so far have been to qualify in Level 2 Professional Cookery and obtaining an NVQ in Care. I have been with Kingsley Healthcare since May 2013 and enjoy working with the residents and staff. I have been with Kingsley Healthcare since May 2013 and enjoy working with the residents and staff. I have learned a great deal during my time here and have developed my people skills in particular. My favourite saying is a Japanese proverb ‘One kind word can warm three winter months’. A bi-monthly newsletter is published and made available to visitors, but it can also be downloaded from the website. Inside you can read all about the events that have either already taken place or are planned for the future, in which you might like to get involved. It also contains announcements from Kingsley Healthcare, future improvements to the home, recent charity events we have been involved in, photos and much more. New year party with residents and families. Starting from 2pm to 4pm. We realise that the move to a care setting can be a challenging time for those moving and their relatives, and we want to make this process as streamlined as possible. Please feel free to contact the home for any information or advice, and if we cannot help you, we will try and point you in the right direction. Please tick if you’d like to receive more information about the home, including newsletters and occasional emails about our home.